Well I'm officially cold! I'm setting in the floor covered up next to our fire. That's the only way I could get my toes warm. My card tonite is a little "thanks" that could be used for any occasion. Can't wait to start on the new card challenges for the week. My brain wasn't working tonite, so I figured I'd better wait till tomorrow. Today has been so beautiful. When I wake up early (which doesn't happen often) I feel like a day last 100 years and I enjoy every second of it (with a nap thrown in of course). I got up early for Church this morning and we had a wonderful service. There's nothing like a little country Church in the Fall. I decided this evening that I would try some recipes out of my new Amish cookbook. I made chicken chowder that was delicious, it was so creamy and a great dish for cooler days. I also made a pumpkin roll from scratch. They both turned out good and I was very tickled with myself. Still amazes me I can cook a little. Just shows ANYONE can learn to cook! My craft tonite is a Christmas card. I like it because I didn't use traditional Christmas colors. It is simple, but that's why I like it. I have a million craft ideas in my head for the holidays, going to have to get to work! I made a card this evening for the CPS sketch this week (http://cardpositioningsystems.blogspot.com). I look at this blog often for inspiration and they have great card sketches to get your mind working! I hadn't intended for this card to match the sketch, but it just all fell into place. And it's suppose to start raining tomorrow with possible...can I say the word???? Snow! by Monday. I'm just not ready for that yet so my card is as bright and Summer themed as possible! Enjoy. I've been a blogging slacker lately. I was so tired that I didn't even turn the computer on last nite...but I must be honest, I was tired from shopping. So don't feel too sorry for me. So tonite, I finished my 2 Sketches challenge for the week and also completed the bonus sketch challenge. 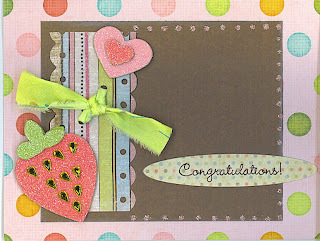 My products I used were papers from DCWV, The Paper Studio and Making Memories, some great stickers from Karen Foster Designs, K & Co., and Doodlebug Designs, stamps from Autumn Leaves, and Stickles. OK here's my take on the bonus sketch. I just love the little crow stamp from Autumn Leaves. Now for a funny story. My little nephew Logan came down tonite to roast marshmallows. Well we decided to make some hotdogs also. While Matt was taking pictures of me and Logan roasting away, two little thieves stole our hotdog buns! Look in the left hand corner of the picture. That's my darling Gracie and baby Jake grabbing a quick snack! It was too funny. My doggies are always amazing me. I was a card-making machine tonite. Hubby is at work, house is clean, laundry is done, and I settled in for some much needed scrapping. Sure I make cards here and there, but tonite I really concentrated. I finished my tin challenge! So here's the finished product. 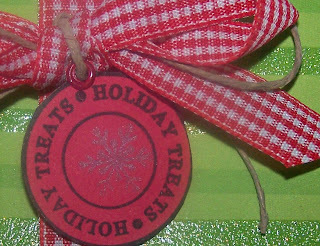 It is a Christmas tag holder with tags included. Made it all with Hobby Lobby paper (who knew they had their own paper? 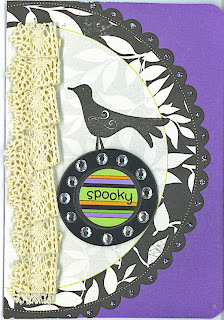 ), ribbon, Michaels $1 stamps, staples, Papertrey Ink stamps, and my trusty Cricut! My next project was a Christmas card. 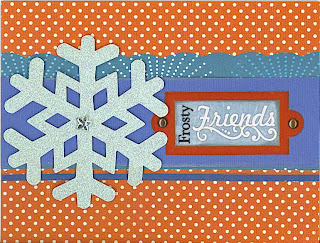 I used some leftovers I had from past Christmas card kits to get the pretty snowflake. This card was very simple, but turned out pretty. Now I couldn't scrap all winter and Christmas stuff. So here's a fun cheery card. Have to work this weekend, so the creating will be on hold a couple of days! I found another blog challenge that looked so fun I had to try it. It is called 2 Sketches For You and there website is http://2sketches4you.blogspot.com . They have some really neat card sketches and all you have to do is follow the pattern to enter the challenge. So I started out with an idea and totally changed my mind. That's the great thing about crafting, no rules. I'm also loving stitching with my sewing machine on new projects, my lines aren't perfect but that's the beauty of scrapping -you don't have to be perfect. Here's my first card. No clue why I made a baby girl card, can't remember the last time a friend had a little girl, they're always boys. But when the event happens I will be ready with cute card in hand. My next card can be used for Christmas or just winter. 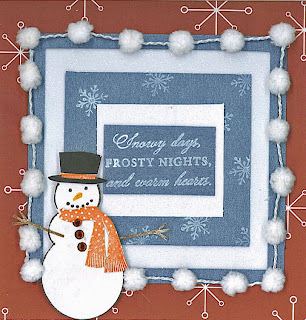 I used my Papertrey Ink stamps...they are great because you build your snowman. This card is much prettier in person and refused to take a good picture because of all the shiny paper I used. So I scanned it. The little puffs aren't as puffy when you squish it with a scanner, but you get the picture! Lastly, I will leave you with a picture of the scary pumpkins Matt and I carved this evening. It was a nasty day in Kentucky, rainy...but we are very thankful for any rain we can get. So we had fun carving our pumpkins on the porch. I carved a crow and Matt carved a goofy face. Enjoy! Today wrapped up my vacation. I made several cards this evening. Guess I was getting in every last scrapping minute I could before going back to work. My first card was scraplifted from my "Cards, Gifts, and More" magazine. I usually don't like to copy someone's work, but I do think it's fun to learn new techniques that way and to get out of a scrapping slump. And I think no matter what you always personalize it in your own little way. I used my Cricut to make my ice cream cone for the card. My Cricut is by far the best scrapbooking tool I have. It does everything and I use it all the time. My second card I love. I made the spider using my Cricut and sewed his web using my sewing machine. It had been so long since I used my sewing machine that I wasn't sure I remembered how. Must be like riding a bike, because it all came back after a few minutes. Hope you like them. OK, so cleaning and organizing isn't something I love to do. At least it was a rainy day and I didn't waste any "outside time" inside. We added some new cabinets and a shelf to my scrapbook room and rearranged everything. My problem is, I can't throw away any of my old scrapbook stuff. For example - this is a picture of my first punch I ever bought, probably around 1998 or 1999. I can't throw anything away, what if I need it or it would be the perfect embellishment for my page. Tonight when I finally sit down in my scrapbook room I got my Christmas paper out and was ready to kick off the holiday...at least I thought I was ready - but to my surprise I picked Valentine's Day instead of Christmas! I must be feeling the love, because I made 2 "love" cards. And I also got a little treat today. 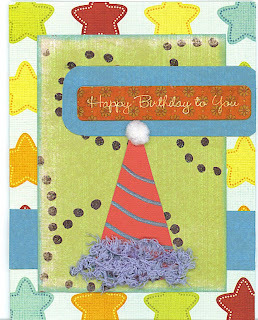 Many scrapping bloggers were giving away a special issue of Paper Crafts magazine for WCMD called "Card, Gifts, and More." Well guess what, I won an issue! 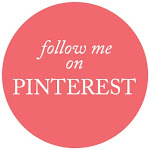 Head on over and check out Teri's great blog where I won my issue http://terisplace.wordpress.com. Hope you enjoy my cards tonight! Well this week I am on vacation and have plans! And guess what they are? To redo my scrapbook room! OK so I am a messy scrapper, terribly messy. The rest of my house is picture perfect, but as soon as company comes my hubby runs to shut my scrapbook room's door. So we took a trip to Lowes today and are ready to get to work this week. So before I have to start organizing I thought I would post 2 cards, they were pretty simple but cute. 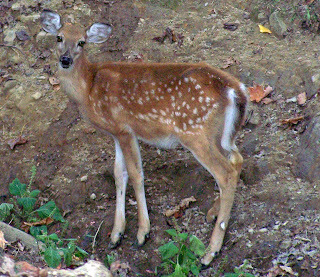 I'm also posting a picture of the cutest little baby deer that was in our goat pasture today. I think it thinks it's a goat:) I have seen it there before and was planning to go looking for it, but it found me first. Enjoy. Happy World Card Making Day! This event has been really fun for me this year. I have a friend who has never tried card making, so I bought her a little card starter kit and we made some cards and had a good time. I'm still loving the felt. Not sure how many more things I can think of to make with it though! I've glued, sewed, inked, cut, and I'm about out of ideas! The cards I'm posting tonight are in honor of WCMD. My favorite - the skull card! It's just so different and I love the Love Elsie line of products and a pink skull is just too cute. Hope you enjoy them. 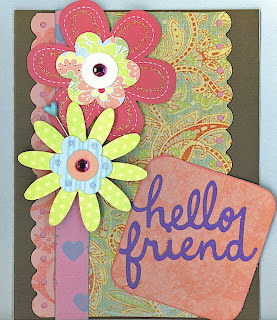 Introduce someone to card making this week, they just might love it!